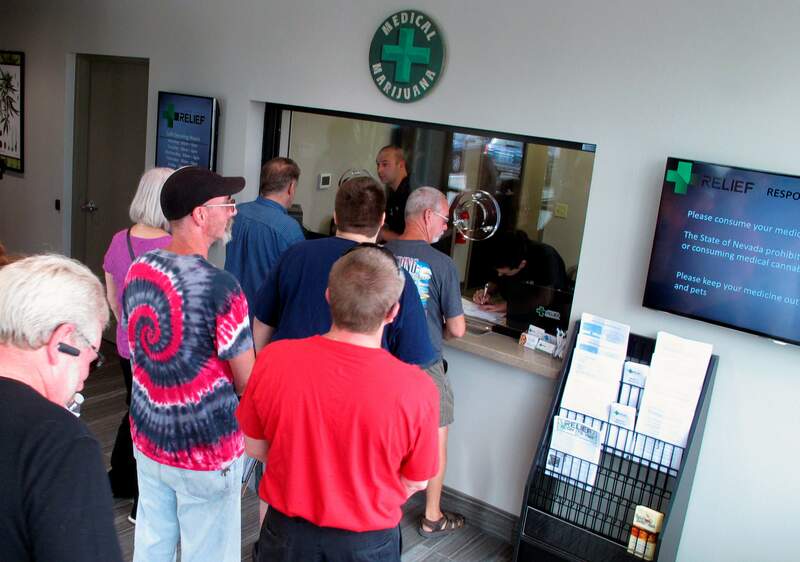 People line up in 2015 to be among the first in Nevada to legally purchase medical marijuana at the Silver State Relief dispensary in Sparks, Nev. A formal campaign against legalizing recreational marijuana in Nevada launched Friday with the support of heavy-hitters including Gov. Brian Sandoval and the organization that represents Nevada’s casino industry. LAS VEGAS – A formal campaign against legalizing recreational marijuana in Nevada launched Friday with the support of heavy-hitters including Gov. Brian Sandoval and the organization that represents Nevada’s casino industry. The group called Protecting Nevada’s Children went live with a slick website in the first major push against Question 2, which will appear on the November ballot. Another campaign supporting the measure has been active for months. Officials declined to name their financial backers, saying that information would come out in mid-October when state campaign finance disclosures are due. Top elected Republicans voiced their opposition to the pot measure, and several called Colorado’s recreational marijuana law a failed experiment. Opponents include Nevada Attorney General Adam Laxalt, Lt. Gov. Mark Hutchison, Reps. Joe Heck, Mark Amodei and Cresent Hardy, and Sen. Dean Heller. Democrats are more split on the issue. Ten Democratic lawmakers offered early endorsements of the recreational marijuana question in June, but Sen. Harry Reid said last month that he was “dubious” about the measure. Rep. Dina Titus said Friday that she’s undecided and still researching its implications. Senate candidate Catherine Cortez Masto told the Las Vegas Sun on Thursday that she’d vote no on the measure, citing concerns about the lack of a banking system for the industry and the conflict it would create between state and federal laws. The casino industry lobby, which registered its opposition Friday, noted that state gambling regulators who are strict about offering up casino licenses are wary of those businesses getting involved in the recreational pot industry. Proponents of Question 2 say marijuana prohibition has helped drug cartels, and argue that taxing and regulating it would bring in money for schools and public services. Spokesman Joe Brezny of the Coalition to Regulate Marijuana Like Alcohol said Question 2 opponents were on the wrong side of history. “They have spent their lives believing that marijuana needs to be illegal and cannot grasp that a majority of Americans – and a majority of Nevadans – no longer do,” he said.